Can beloved retailer Toys R Us make a comeback? February 20, 2019, 9:40 a.m.
Toys R Us was a beloved retailer from every Briton’s childhood, but sadly became yet another high street casualty in 2018. Management struggled to find a buyer in the wake of the collapse but eventually 100 shops and more than 3,000 jobs were lost. However, wind forward to October and Toys R Us lenders announced they would cancel a planned sell-off of the brand, leading to speculation that the retailer could potentially bounce back from collapse. Exactly this has now begun to happen in the US this month. But as we wait for news of a similar resurgence for the brand in the UK, what does the landscape look like for Toys R Us here? Data from YouGov shows that Toys R Us’ Buzz score (a net measure of whether consumers have heard anything positive or negative about the brand in the last fortnight) plummeted after news of the bankruptcy broke, from an already low -8.5 to -48.9. However, since then, their Buzz score has risen back to levels not seen since before the crash (-1.4) despite not having any stores open in the UK. 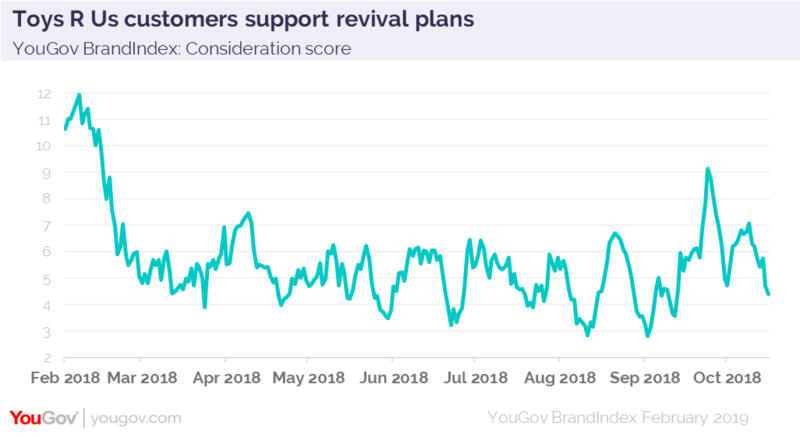 More importantly, Toys R Us’ Consideration score (whether someone would consider purchasing from the brand in future) peaked in October at +9, suggesting that the public would support a revival. When asked where they now currently shop, almost two fifths (38%) of former Toys R Us customers told us they currently shop at Argos and over a third (35%) at Wilko. These customers would need to be enticed back however this can be seen positively for Toys R Us; the fact that former customers moved to brands with strong high street presences implies that a preference for online shopping wasn’t solely responsible for the decline. Former Toys R Us customers are generally still in the market to shop in stores as opposed to online, as long as the experience is good – more than half (51%) buy gift cards and spending time with their family is important to them (83% compared to 75% of the nation in general). If Toys R Us can recreate a good shopping experience in stores and harness the affection Brits still have for the brand, then perhaps Toys R Us will be ready for a comeback.